Hello!! It has been a little while since my last blog, but I’ve been on my jollies, having some fabulous family time in the sun. Weeks running up to me going I was trying to get my day job finished, then some Crochet sanctuary stuff sorted, and designs! @lyndascraftroom and I have a few projects we are working on at the moment, including the autumn cal for Knitcraft, some bits for Marriner yarns which is exciting. You know we love Knitcraft yarns, well we also very much like Marriner. You should really take a look as they have some stunning yarns and very well priced. 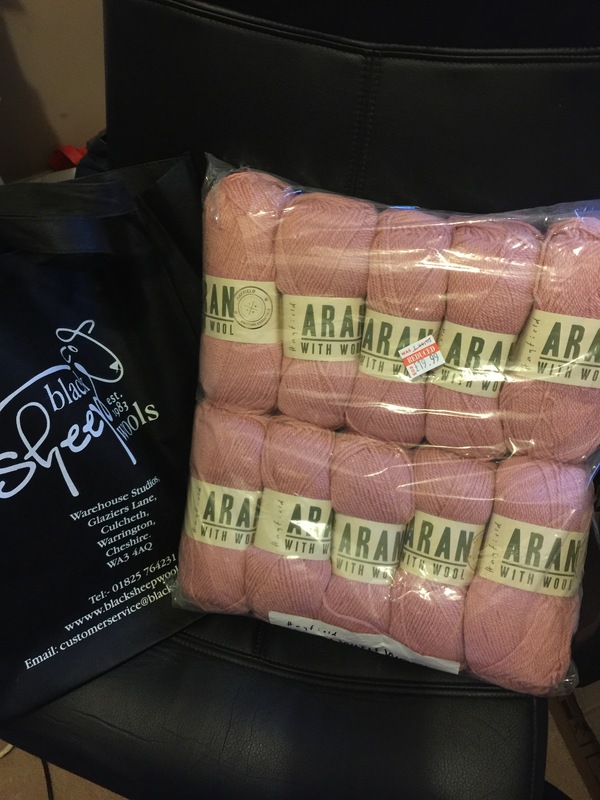 In fact I think they under price their yarn, which can often make people think it’s cheap or poor quality, but it’s not, they’ve got some good dk’ sand some fabulous chunky verigated yarns and beautiful cottons, have a look! That was all the crochet I found!! I didn’t get much done whilst I was away either, took plenty of wip but it was too hot. We were given a list of items to crochet using granny squares, I chose the hot water bottle, using Knitcraft in the zone, I love the bright colours and the yarn just glides over the hook, lovely stuff! Then whilst I was away my Not so little box of crochet arrived!! My neighbour kindly took it in for me, oh wow!!!! It’s amazing!!! It’s designed using intarsia crochet…….never tried it before, and I don’t think I will again! Thank goodness the pattern Said we could use tapestry, intarsia for me is just a mess at the back, and I wasn’t leaving a long enough piece of yarn, tapestry is much easier, I’m not posting a pic yet as I’ve only done about 6 row after frogging the intarsia! It’s beautiful though and I know Amanda still has some boxes so you should order! We’ve only got 5 weeks until the next crochet sanctuary Yayy!!!! I’m so excited, it seems ages since the last one. We’ve got the rather fabulous Heather from KCACOUK hosting our guest designer workshop on the Saturday afternoon, which I’m really looking forward to. And we’ve completely sold out until June 2019! What’s that about?! Who ever knew we’d sell weekends so quickly, and to think @lyndascraftroom and I were sick with nerves when we started! We do love it, and we have some amazing guests. Isn’t she gorgeous?! There is also an option to supersize her, so I’ll see how much it is, I’ve been a little naughty recently in terms of yarn 🙈 I can’t help myself. I’ve still got my nameless blanket to finish, Sophie’s universe, 2 Sophie’s stools, a Mabel bunny from wool couture, primavera blanket oh jeez the list goes on and on! And now I’ve bought this!! Couldn’t not to be honest! Sneaky little purchase while lying by the pool, ah well!! I really do nee to start concentrating on finishing some WIPs it’s starting to take over the whole house, and that’s without the crochet sanctuary deliveries. So we will see about Chablis!! So yes I think I’ve caught up, will let you know how the toft workshop goes!! Good Evening! February is sneaking up on us fast!! So is April, so we’ve launched dates for the April Sanctuary yesterday. @lyndascraftroom and I have been to wales today to Abakhan, if you’re in the UK it’s well worth a visit, we normally go to the Liverpool branch but today we decided to go to Mostyn, they’ve a building each for yarn, other crafts and fabric, funnily enough we didn’t go yarn shopping but we did go fabric shopping, this is for one of the workshops we’re running in February, that’s all I’m saying, apart from Abakhan in Mostyn is Fabulous! It’s set in a nice rural area too. They’ve some fabulous yarns in stock but also yarn seconds, so yarns without ball bands, I bought some of this last year when I needed a super chunky for a doughnut pouffe, super chunky in big volumes is quite expensive so I managed to get it from Abakhan at a fraction of the price, but mixed it in with some hobbycraft hug it out too, any way worth a visit. We’ve still got a lot of raffle tickets for February Crochet Sanctuary plus one weekend pass available to buy, we’ve sold 47 raffle tickets for February so the odds are really good if you buy one!! And don’t for get we’ve a fab workshop from the lovely Eleonora from @coastalcrochet which I’m really looking forward to!! So if you would like to buy a raffle ticket the draw will take place next Saturday on Facebook live, and Instagram, the tickets are £5 and all you need to do send monies to PayPal hello@thecrochetsanctuary.co.uk and we’ll send a receipt confirming ASAP, like I say we’ve sold 47 so odds are good! 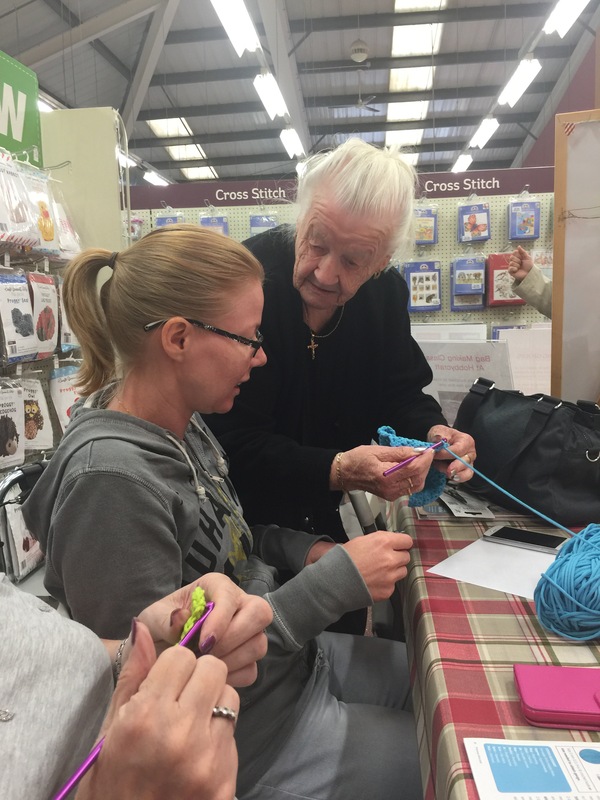 For April our dates are 20th to 22nd April for the weekend and the day pass is for the Saturday 21st, and I was absolutely gobsmacked when Amanda Bloom from Little box of crochet agreed to run a workshop for us!! Shocked actually!! I’ll be tongue tied literally 🙈 I’ve met Amanda a couple of times and each time I do I make a fool out of myself! Now because it’s January we’ve lowered the deposit cost, so it’s just a small deposit of £50 to book the weekend and balance due 6 weeks prior to the event, we’ve already got a few people booked on Yayy!! We’ve got ideas bursting for future workshops just bursting! And we’ve already got June planned! Anyway! Only one crochet pic from me this week as we’ve been designing the Spring CAL for Knitcraft which is going rather well. Afro hair, I found a lot of the ‘headbands/ear warmers’ on ravelry rather girly and not really for a 7 year old boy, so I whipped up a quick on myself, then another for Abby to wear, I used Knitcraft leader of the pac, I’ve honestly got to say it’s the nicest alpaca aran weight yarn I’ve tried it’s just lovely, and I’m lucky to have a gorgeous girl to model it for me!! It’s late! So happy hooking!! !